A coffee table is always our first preference when there is matter of guest entertainments! It is a piece of furniture than provides focal stimulation to any of sitting plans especially that of living room! Most of the coffee table comes with low height levels and as low tops make it really easy to serve the refreshments to seated guest and other VIPs! 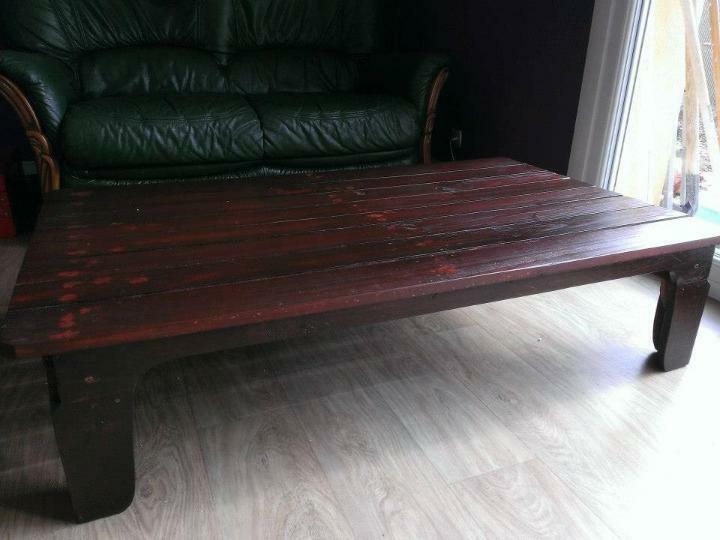 Want a coffee table on a budget? 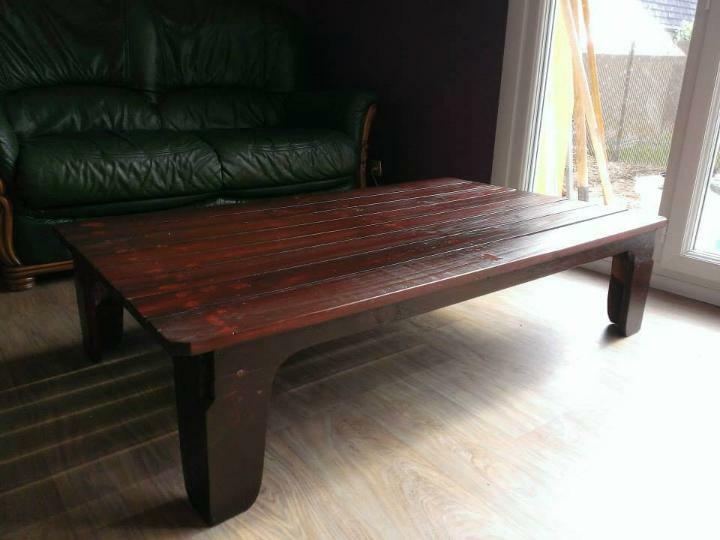 Just try your hands on pallets to get a sturdy one in no time, this DIY pallet coffee table inspiration can really help you to achieve your goal! Design of the table contains a low but wide top level and comes on legs that have just been built to last! Table is a is of top wood quality and can really bring vintage style to any of your cozier and modern living room! 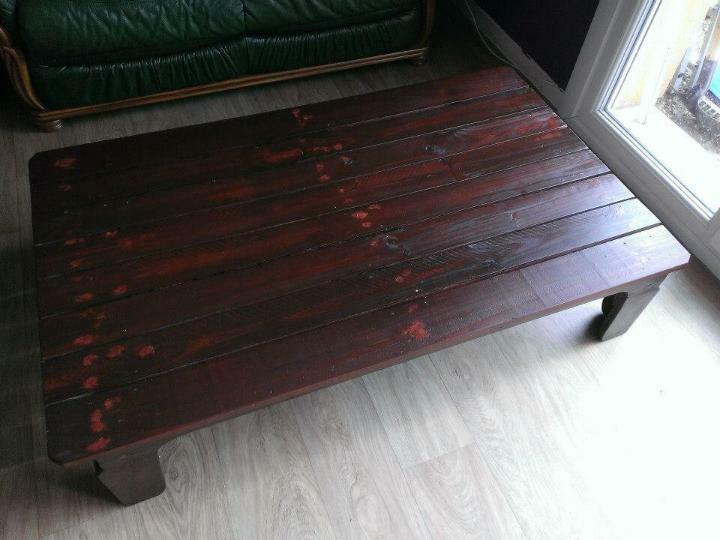 For a dark enchanting wooden tone,”Pallet Coffee Table” has been stained and this would also be useful to add weather and water protection to wood! Pallet wood is a life changing wood in our book of thoughts! It can really makes the too expensive furniture pieces affordable to you just by a little effort and planning! Build beauteous and sturdy tables with pallets by just making them deconstructed, modified and reconstructed! Nothing but the moved pallet pieces have been installed to build up this beauteous table design! Equally thick and long planks have been selected to build the tabletop and legs have been made by getting an L-shape of two cut down pallet slat sizes! Nails have been added to hold all tightly in place and whole of the design has been stained at the end for a different wood tone and amazing protection to wooden surfaces! Stain will really protect the wood from getting signs of wear the tear so early!